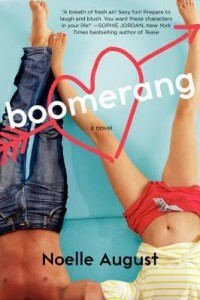 Fun and flirty, Boomerang is told in the alternating perspectives of Mia and Ethan, two driven interns ready to start their careers at the new millennial dating website Boomerang.com. At a bar the night before the internship begins, Mia and Ethan accidentally meet and instantly connect. Their fantasy is short-lived as they learn the next morning they are competitors for a full-time position being offered to the best intern, and Boomerang.com has a strict policy against dating coworkers. While the couples’ forbidden chemistry is the story’s main focus, Noelle August also takes readers through the trials of finding a place in the world post-college in this energetic New Adult novel.